When this York, PA family moved into their new home and set up their existing patio furniture, they were dismayed to find that it barely fit. Chairs were practically falling off the edge of the tiny concrete patio and there was hardly any room to move around the space. 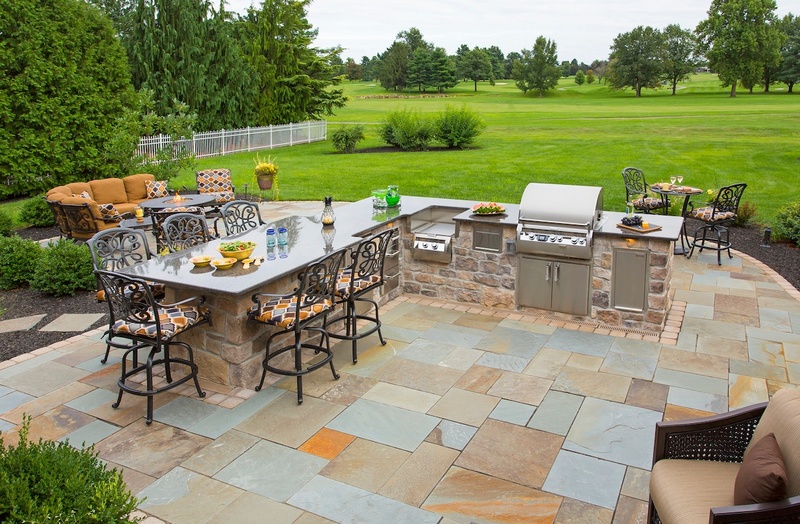 The family knew that they needed a bigger patio—not only to accommodate their furniture but to properly entertain. 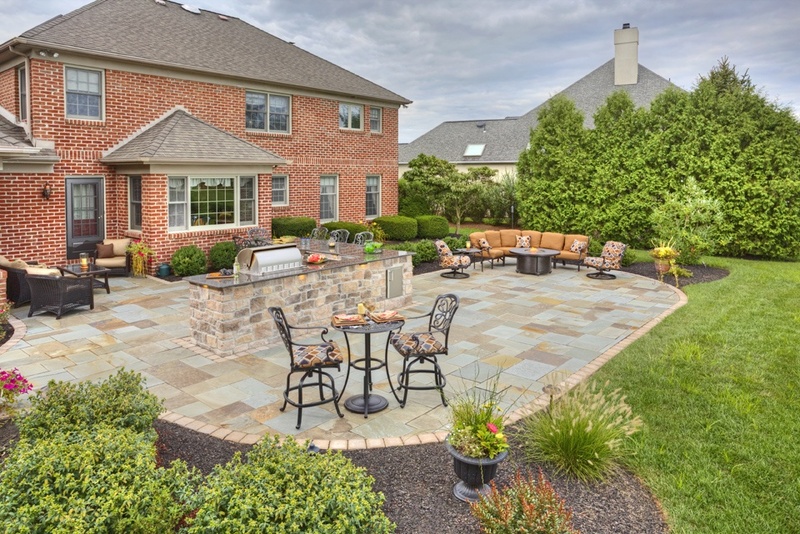 This led them to start looking for the best patio builders in York, PA.
Their wish list included a large, natural stone patio with an outdoor kitchen, seating area, and a walkway connecting the patio to the driveway. The homeowners also desired some simple landscaping around the patio area. Their end goal was a space that they could enjoy to the fullest. 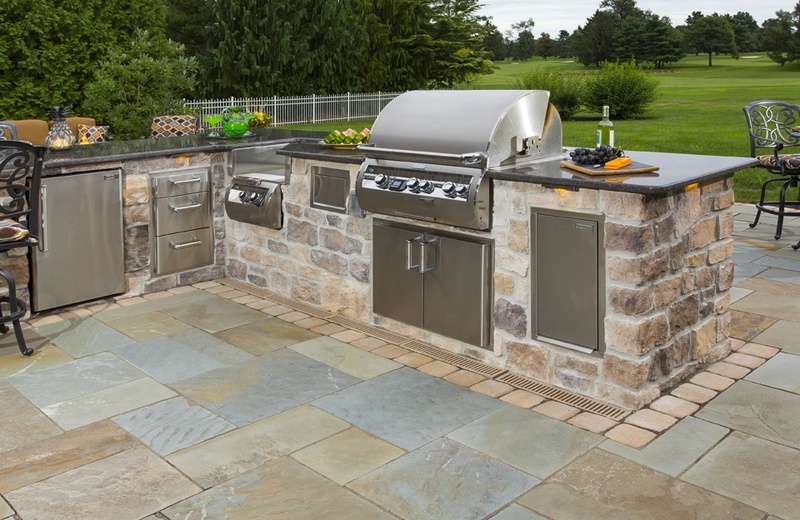 Achieving that goal all started with a brand-new patio. To get started, the existing concrete patio had to be removed so that we could start from scratch. 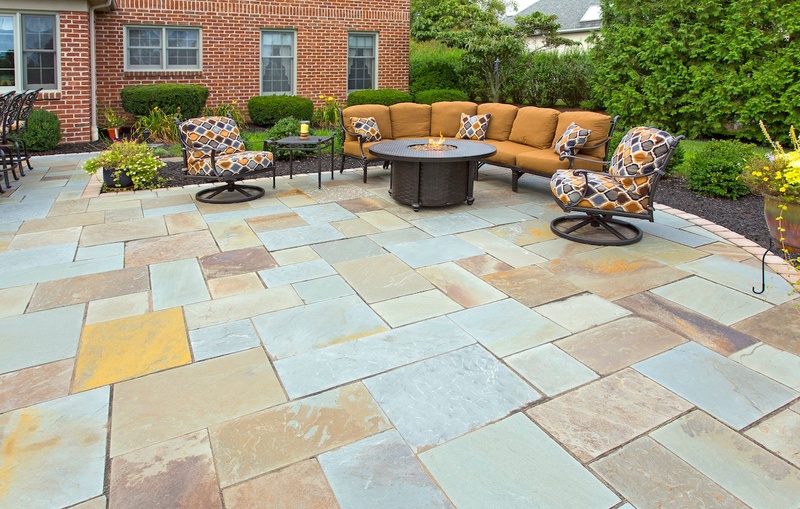 The homeowners already had some ideas about the material they desired for their new patio. While the house was brick, they really liked the look of natural stone and ultimately chose flagstone for their patio material. However, in order to keep the project in line with budget and to also incorporate a brick-like look that would seamlessly blend the home and the patio, we used a Techo-Bloc paver as a patio border and to complete the new walkway (which lead to the home’s driveway). This style kept with the overall traditional look of the home that the homeowners appreciated. Of course, the size of the patio was also crucial. 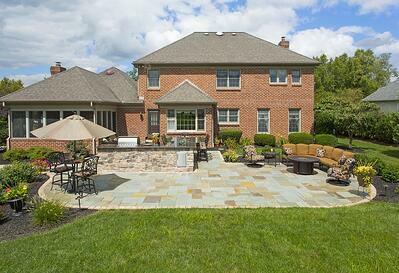 The homeowners wanted an expansive patio to accommodate all of their existing furniture from their previous home. 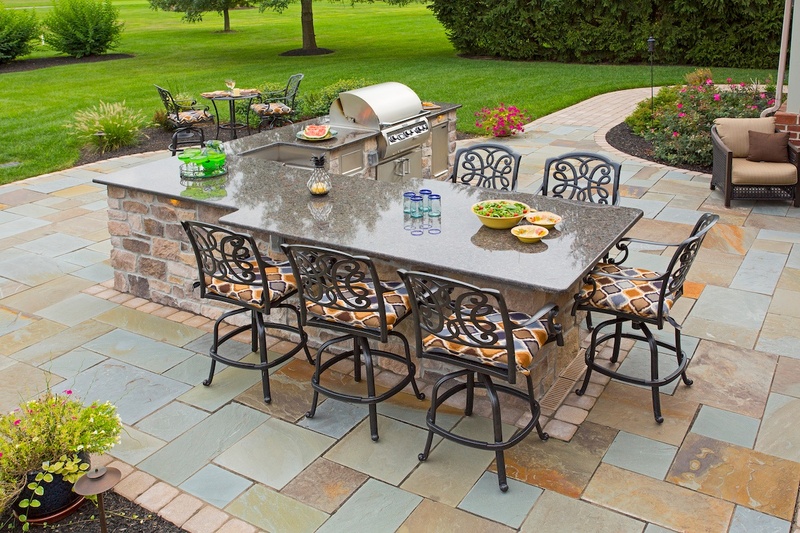 They also desired an outdoor kitchen with separate prep/cooking space and seating space at the countertop so that the chef could still socialize with guests. Plus, they wanted enough room to have an entirely separate seating area, which could be a bit more intimate with a fire feature. This lead to the design of a large oval-shaped patio which could incorporate each of these spaces. The homeowners liked the idea of a spread-out space in which they could really move around and accommodate guests when they were entertaining. Functionality was important to this family. After briefly living with the cramped and tiny concrete patio they originally had, they were ready to move on to something more functional. The kitchen also has quite a few special features that make it highly functional. This includes a built-in trash container, a high-end grill with built-in cabinets underneath for storage, a built-in paper towel holder, a power burner (for boiling corn or big pots of chowder), three extra storage drawers, and a built-in refrigerator. 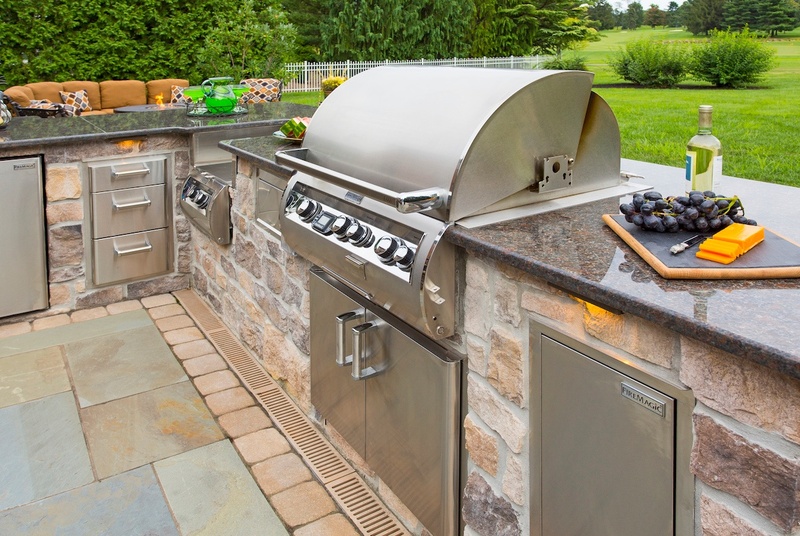 The homeowners wanted to have everything they needed in their outdoor kitchen so that they didn’t have to run in and out while entertaining guests. The views on this property were important to the homeowners as well. At the time of the construction, the husband had recently been hired as the new golf pro for the golf course that this home overlooked. The view of the course was a big appeal to the husband, who also happened to be the griller in the family. That’s why we positioned the grill so that he could have a great view of the course while cooking. The view from inside the home looking out was also important to the family. The large picture window was part of the home’s dining area and the family liked to be able to eat a meal inside and enjoy their view of the outside. For this reason, it was important to them that the new kitchen did not obstruct their view. We carefully arranged the landscape design, playing around with some of the angles, to ensure the family still had the perfect view from their dining table, even after the kitchen was installed. 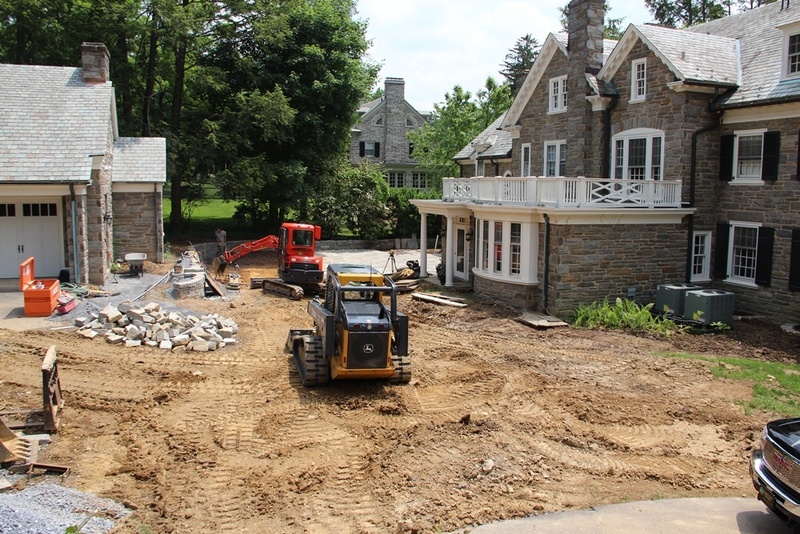 Oftentimes, with a new patio project, there are township requirements that come into play. That was the case here, where the amount of hard surface being added in the form of this large patio made it necessary that the homeowners also incorporate a stormwater management solution. We achieved this with the installation of underground piping that connects to a seepage pit which is hidden underneath a plant bed. We worked with the township on this design in order to ensure their approval. Stormwater management can be complicated but it’s something that we’re accustomed to dealing with. In this case, we were able to incorporate a solution that solved any runoff concerns without impacting the overall aesthetics of this patio in any way. This York, PA family came in with some simple yet very specific requests and we were successful in meeting all of them. They expressed that they were very into a traditional look and it was our goal from day one to stick to that style. Our assistance with finding the right materials and design to fulfill that style helped ensure that their colonial home blended nicely with the brand-new patio which was added to the space. In the years following this initial patio and outdoor kitchen project, we also assisted with the surrounding landscape design—which was also simple and classic at their request. We incorporated some boxwoods and some basic container gardens to contribute to that traditional look they liked so much. 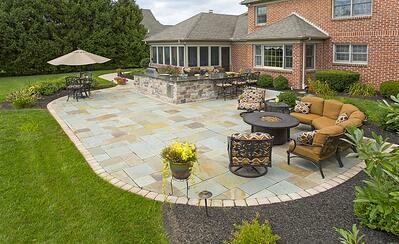 When it comes to choosing amongst patio builders in York, PA, the choices are plentiful. A lot of companies offer patio construction. But you don’t just want any old cookie-cutter patio. You want something that truly solves your needs—just like this family did. Chances are you have very specific requests and you want them to be listened to. 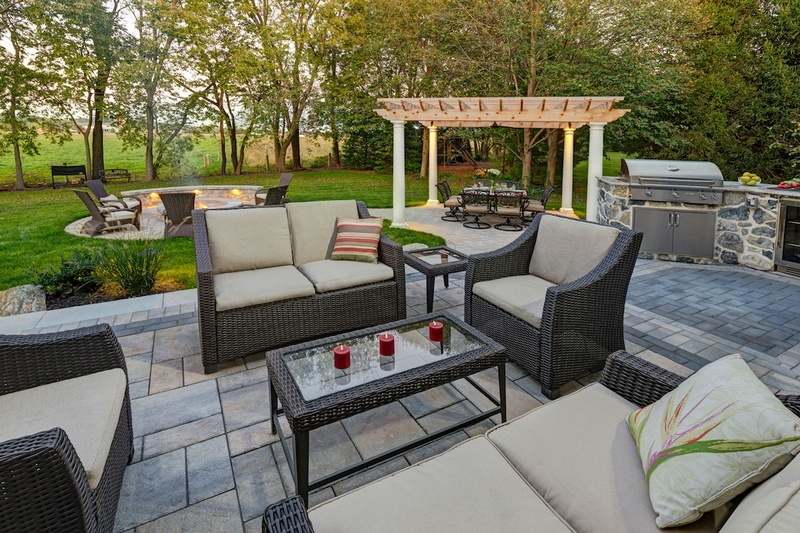 You don’t want to end up investing in a patio that isn’t what you wanted. It is always our goal to work with the specific wants and needs of our clients and to offer solutions and ideas that will take their dream and make it even better. That’s why our clients are often left saying “it’s even better than I dreamed it could be.” No matter how basic or how complex a project, we’re always looking to bring it to life in a way that leaves our clients feeling that they got the space of their dreams—and beyond. 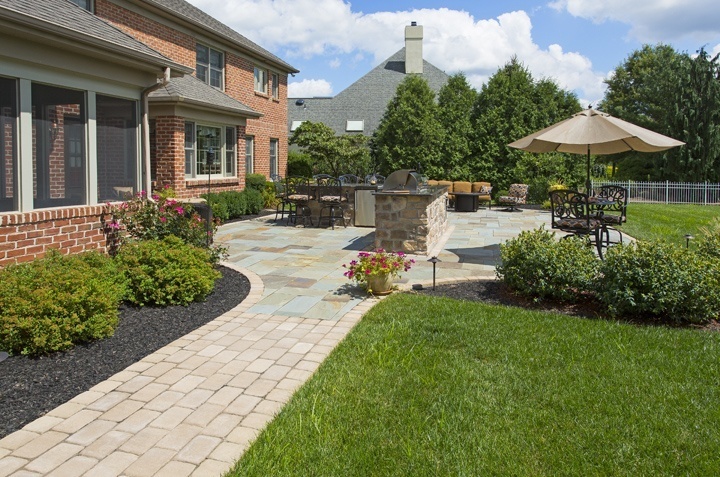 If you’d like to start a conversation about how you can bring your outdoor dreams to life at your York, Reading, Lancaster, Lebanon, or Hershey, PA home, contact us for a free consultation or give us a call at (717) 276-9447. Mary Hatch Dresser is a Registered Landscape Architect with a Bachelor’s degree in Landscape Architecture from the University of Georgia School of Environmental Design. 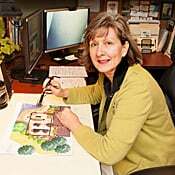 Mary has designed landscapes for 32 years and joined ETW exclusively in 2009. Mary is a member of the American Society of Landscape Architects (ASLA); and also serves on the Shade Tree Committee in Strasburg Borough where she resides. Mary prides herself in carefully listening to her clients to professionally meld their ideas and personal criteria with sound, experienced design practice. 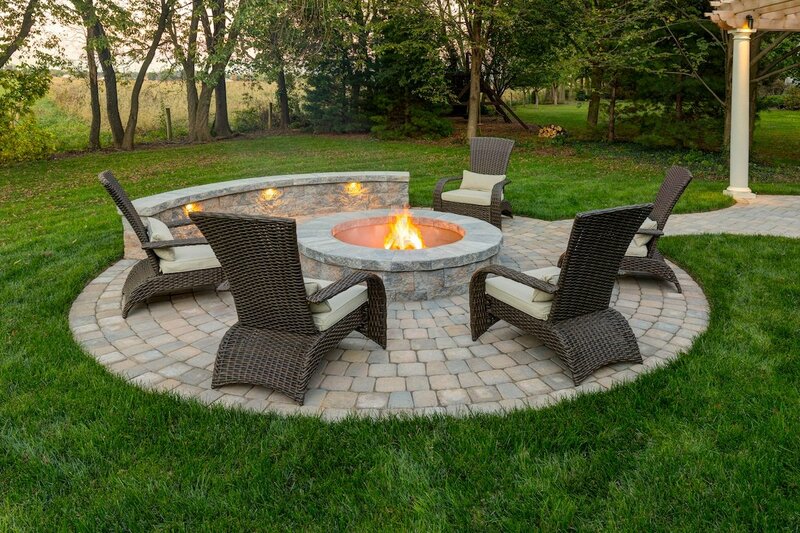 Where to Build a Fire Pit: On the Patio or a Separate Area of our Landscape Design?